SPWaW FULL GAME and PATCHES - Download Links! Status: offline The Depot now hosts the complete game and all patches. Status: offline Bump - People seem to not notice this. Back to the top. Is that a download link to a free version of the same game I just paid 70 bucks for...? Status: offline Ah, I see. Well, the idea of the Mega Campaigns was the reason I bought it, so all is fine. Status: offline Sorry for the question but exactly where do I place the patch. I 've tried downloading it into the Steel Panther general folder and it doesn't get applied. There are multiple sub folders in Steel Panthers such as saves,scenerios etc. I'm trying to patch up so I can play the enhanced version. Sorry for the question but exactly where do I place the patch. I 've tried downloading it into the Steel Panther general folder and it doesn't get applied. There are multiple sub folders in Steel Panthers such as saves,scenerios etc. I'm trying to patch up so I can play the enhanced version. Status: offline Does the free downloadable game include SP3, the modern stuff? Does the free downloadable game include SP3, the modern stuff? Status: offline So the free game has no less features than the paid version aside from the mega-campaigns - no extra resolution? I am the god of thunder and lightning!!! Status: offline It's exactly the same, except for the mega campaigns. It's exactly the same, except for the mega campaigns. Status: offline Seems that SP:WAW has gone by the way side, has anyone updated the code or does anyone still maintain it? I know that SP:WW2 has still been maintained and updated (currently). I am guessing this was written in C.
I know that it no longer runs on W7 (at least for me the graphic are like stretched and look terrible). It would be cool if the code could be updated. Does Matrix have anyone working or maintaining the code base? Do they need a volunteer? Status: offline Here are all the Mega Campaing patches for SPWAW. -unzip the file and place these scenarios into your Megacam\The Desert Fox-41 folder. -Unzip to your "Megacam\LostVictories" folder owervriting the old files. You need to unzip these pathces in correct order! -Unzip the files into your Steel Panthers World At War\SND folder. No it doesn't. It is exactly the same game as the free version except for the mega campaigns. The resolution is always 800x600 and the game suffers from the same problems as the free version on modern computers. The mega campaigns also have some issues with the game crashing if Command & Control is turned on. There may also be compatibility issues with the OOB files and the mega campaigns. Status: offline Also worth noting here to make things more clear is that the SPWAW Enhanced mod is not to be confused with the SPWW2 Enhanced CD version. Both use a similar naming but SPWAW Enhanced is just the old Matrix Games "Steel Panthers: Wold at War" v.8.403 game from 2004 with user made graphics, sound and OOB changes. There are no updates to the actual game code. 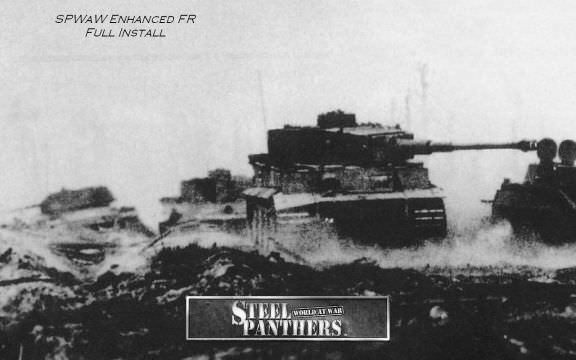 The SPWW2 "Steel Panthers: Wold War 2" (and enhanced cd version) from Sharpnel Games is a completely different game and was last updated in 2016 and continues to be developed. Status: offline Yes,im more interested in this one.Thinking of getting it on CD(mainly for the better Res)Matrix doesnt sell the second one am i right?shame that,if that's the case.anyways thanks for the info. Status: offline @Dlazov66 May i say "that is one heck of a Siggy you have there!!" Status: offline What is the main difference between 8.2 Full version (420mb)- Steel Panthers World At War Full Version 8.2 and SPWAW Enhanced 2016? Is the 2nd the best of the two to play? is there also a good strategy manual around to help you get started? Status: offline SPWAW Enhanced puts together SPWAW 8.2, newest patches (up to 8.403 if I recall correctly), Enhanced mod, and then some more. All in one, neat installer file. Of the free downloads, it is the best. ... ... is there also a good strategy manual around to help you get started? here are some links to get you going. They are a bit dated, but the info is still valid. That should keep you busy reading for a while. PS: I should really bundle theses up with the SPWaW 2016 D/L ............. hmmmmmm, maybe on the next update. Status: offline Thanks a lot Gentlemen!